Maintenance & Installation Saf-T-Eye® Observation Ports – Tate-Jones Inc.
Tate-Jones units are for use in low pressure applications (5 PSI) where 100% shutoff is not required. • Cut hole in furnace wall approx. 1/8″ larger than the A & I Dimensions. • Position studs provided by customer. • Place flange gasket (13) to flange on Saf-T-Eye® (E Dimension). • Insert into furnace wall opening. • Securely tighten nuts on studs. • See catalog dimension sheet for stud location &amp; furnace wall hole dimensions. – To clean the interior of the glass, the frame (10) must be removed from the body (14) of the Saf-T-Eye®. – When this is done, the Saf-T-Eye® is no longer considered pressure tite. 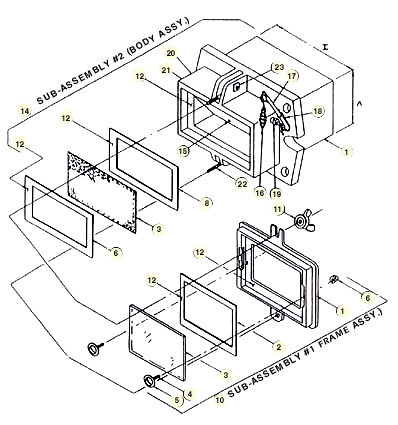 – We recommend this procedure (as shown in sub-assembly, #1 & #2 be used once the glass has been cleaned or replaced before the equipment is put back in to operation. Apply 1/8″ bead of sealant (12) to interior lip of frame (1). Place frame gasket (2) onto sealant (12). Repeat with 1/8″ bead of sealant (12). Position glass (3) into place on sealant (12). Position truss head gaskets (5) over holes in the interior of frame (1) & place truss head bolts (4) thru holes. Apply 1/8″ bead of sealant (12) to interior lip of body (7). Place gasket (8) onto sealant (12). Place screen (9) onto sealant (12). Place gasket (8) onto screen (9). Place assembled frame (10) onto sealant (12). Position metal washers & wing nuts (11) in place & tighten.